Does anyone have a recomended Boost Controller? This link has a good 'how to' on boost controllers for Volvo turbos. With the ECU controlling the boost you may not get what you want with a MBC. I plan on running his setup with Voodoo IV controllers once I get my other issues resolved, exhaust installed and upgrade the ECM. I also have an accuboost controller (http://www.boostsciences.com/) on a 1980 Porsche 924 Turbo. Easy to adjust and well built, however they say its range is 0-30 psi, I can't get it to go under 10psi, which is fine for this car, that also the reason I did not go with them for the Volvo. Last edited by matthew1 on Wed Jun 02, 2010 8:55 pm, edited 1 time in total. 3barracing has one for $40 and installs in minutes and makes a big difference on cars older than 1999. The above link no longer works, so let me ask: is a MBC installed in the POSITIVE pressure line that goes from the BCV to the wastegate servo? I was looking around on ebay, assuming it'd be installed in the above line, but then got the impression that they might be designed only for NEGATIVE pressure lines. Or could you just install it "backwards" for a positive pressure line? Thanks! I've had a $80 Hallman ES MBC in my 850 T5 for months and it's great. Yes, you can make one for $20. If I could do it over, I'd go that route. It's just a dead-simple mechanical device that either works or doesn't. You'll know the second you accelerate from your driveway if you've gotten it terribly wrong. IF you have a boost gauge. It boosts to 15psi in 2nd, 3rd, 4th gears, and up to 10psi in 1st. Stock T5 behavior is 10psi in any gear. I do not have an ECU remap/chip/tune. I do have an R ECU. I do not get fuel cutoff until ~90mph / full throttle. I do have a boost gauge. I would feel very uneasy using an MBC without one. 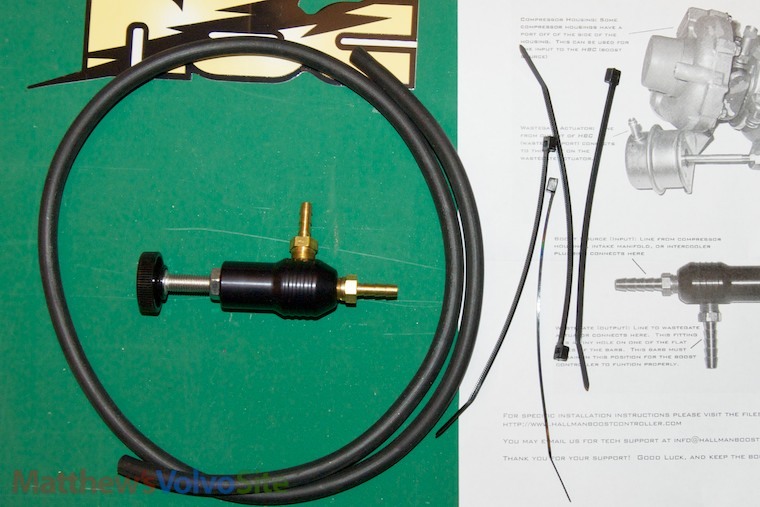 If you have a moment, would you mind explaining where/ how you installed the MBC in your vehicle? Is it before the TCV or after, directly inline or did you use t-fittings to use both the MBC and the TCV, etc? I have a '01 S60t 2.4 (no, I wish it was a R design, but sadly it is not) and have been searching high and low for info on how to utilize a MBC without building too much boost in the low gears. 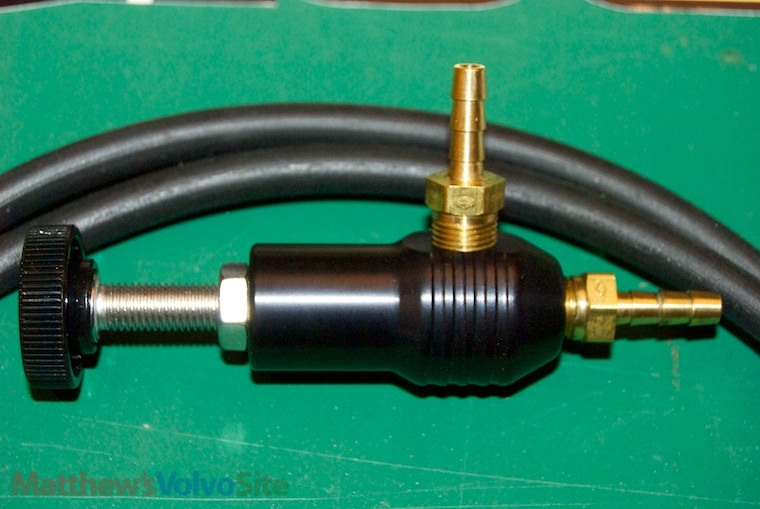 I have posted a diagram that someone shared with me at this link - www.matthewsvolvosite.com/forums/viewto ... 94#p248994 and would love to know how this compares to your configuration, or anyone else's who has had success with a MBC in a turbo Volvo. Currently, with the configuration shown in the diagram (and I'll be glad to post it again if you would like, I just didn't want to over do it) I can't get over 9lbs of boost. 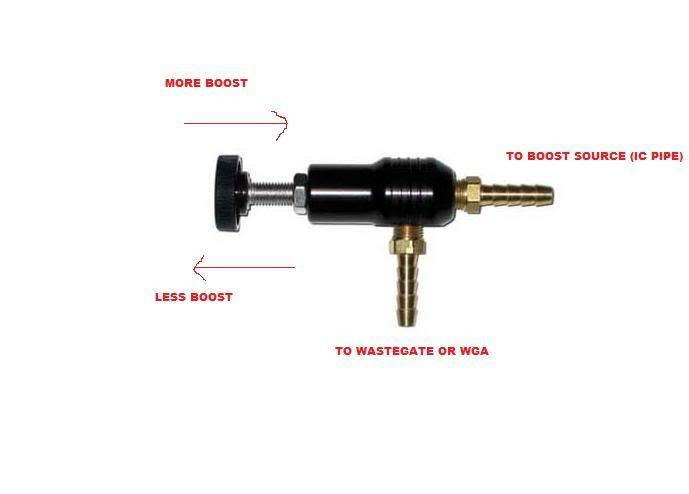 This method works in conjunction with the IPD TCV, so the boost in the low gears is regulated by the TCV/ waste gate actuator arm (set @ 4.5 - 5#) but I'm wondering if there is constant bleed-off to the waste gate which won't let me get over 9#. Any help would be VERY much appreciated as I've been chasing this one for quite some time. Thanks! I capped two of three TCV ports -- the same two (green and yellow in that chart, NOT as labeled on the TCV) that now have no job to do. Thanks so much for taking the time to respond. Finally the mystery is solved. There are several (and likely many) others with the same questions and on several threads. Is there any way to combine so that all could see the above sought after answer? Would you like me to message you links to the threads I found? Just want to give back what you passed on to me. Thanks again. SweedSpeed wrote: Thanks so much for taking the time to respond. Finally the mystery is solved. Geoffrey, thank me after it's working in your car . Last week I found a few MBC topics, pointed them to this topic, then locked them. If you see more, please either post in those to come to this topic (and I'll see that you did that, then lock them) or simply post their links here and I'll take care of them. I am also looking into installing an MBC, since the stock TVC is damaged. I was doing some researching in google, and read that insalling an MBC can be hazardous to the engine do to something called "spiking". Is this true?